The world loves its cell phones – so much so that there are more cell phones on this planet than people! While these technological devices can offer incredible service and ease in a hectic, modern world, they can also be a serious health hazard. Cell phones emit radiofrequency energy, a form of non-ionizing radiation. Our bodies absorb this radiation and have a difficult time processing it – leading to numerous bodily complications. One study found that 10 years of cellphone use resulted in an average 290% increased risk of brain tumor development. Interestingly, the tumor development was found on the side of the head in which the cellphone was most used. And while everyone’s soft tissues are especially (negatively) affected by cell phone use, due to developing organs, lower bone density of the skull, lower body weight, and a less effective blood brain barrier, children are very vulnerable to cell phone radiation. It is easy to see why protecting yourself from cell phone radiation is more important than ever. Below are 10 tips for reducing exposure. 1. Use the speakerphone on your cell phone when you can have a public conversation, or hook your cell phone up to an earphone or headphones to keep it as far from you as possible while still talking on it. 2. Keep your phone charged up. When the bars are low on your cell phone it is working harder to capture a signal from the radio towers, which means that the radiation it emits is even greater. Only make calls when your signal is strong. Consider texting when you can’t charge your phone. 3. Text instead of talk. This pings the cell phone towers for seconds rather than minutes and minimizes your radiation exposure. 4. Don’t talk while you drive. 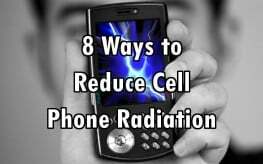 The constant movement means that your phone is also trying to make contact with cell phone towers over and over again, increasing its frequency, and therefore your radiation exposure. But you shouldn’t text while you drive either – so don’t do anything while driving! 5. Look for low–radiation emitting phones. There is a list of the 20 best phones for low-radiation emissions, here. The Samsung Galaxy Note is at the top of the list – sorry iPhone users! 6. Go old school. Use a landline. If you are under the age of 20, you might scoff at this suggestion, but landlines don’t expose you to radiation. Wait to talk to your BF at your grandmother’s house on her old wall phone. Your brain will thank you. 7. Don’t put the cell phone to your ear until a call connects. Dial on speaker phone and then if you must talk straight into the phone, only talk once your end-user picks up. 8. Minimize use. Talk less on your phone and you will be exposed to less radiation. I know this is difficult for some of us, but when you can have your conversations in person. I recently took a vacation for an entire week and couldn’t use my cell phone at all. After the first day I had technology withdrawal since I was so used to having a phone in my hand, but after that, it was remarkably peaceful not to have to respond to every little thing within minutes. 9. Keep your cell phone far away from you while sleeping or simply not using your cell phone. There is no reason for it to be close to you if you aren’t using it unless you’re expecting a call – especially if you keep it on sound, not vibrate. 10. Lastly, consider investing in some form of radiation protection. There are tons of products out there, such as Global Healing Center’s cell phone radiation protector. You can also protect yourself from radiation in your home by placing a large electromagnetic field protector in the area.